Westwide SNOTEL basin-filled map December 9, 2018 via the NRCS. Cortez was at 103 percent of normal for total seasonal snowfall. The seasonal average through December is 11.4 inches. The Four Corners and Southwest Colorado remain in the worst category of exceptional drought, according to the U.S. Drought Monitor, but the area of exceptional drought is shrinking, Andrus said. Natural Resource Conservation Service Snotels, a group of monitors that measures snowfall at various elevations in the San Juan Mountains, showed the combined Dolores and San Miguel river basins at 96 percent of normal as of Dec. 7. The Animas River Basin was at 96 percent of normal. 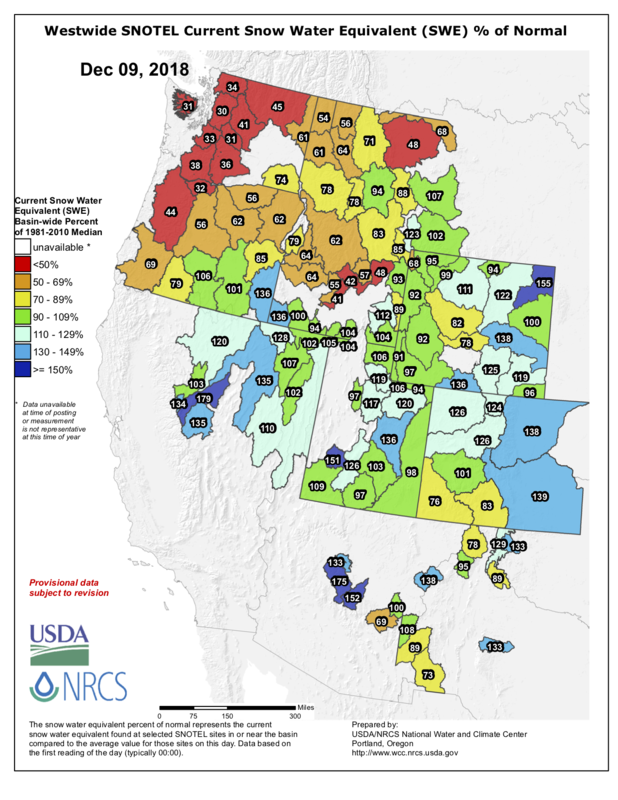 The overall Colorado River Basin above Lake Powell was at 115 percent of normal. The 30-day forecast shows the Four Corners with above-normal precipitation, according to the National Oceanic and Atmospheric Administration. Ski areas are off to a good start. Purgatory on Friday reported 26 inches of snow at the base and 32 inches at the summit. It has six of 12 lifts open. Telluride has a 34-inch base, and eight of 17 lifts are open. Wolf Creek has 42 inches at the base, 47 inches at the summit, and eight of 10 lifts open.